The "Mid" Tigers originally had a pistol port for the commander, but in October 1943 it was deleted from the tank's design. 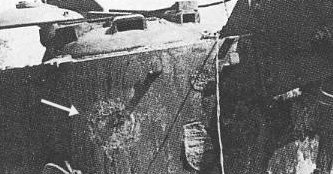 This photo of the "Bergepanzer Tiger" shows that it had a hole in the turret wall for the pistol port, but that hole was sealed up with a welded plug. As you can see in the photo, it had a smooth finish and would be invisible under Zimmerit; only the removal of Zimmerit from the turret walls allows us to see it. It's hard to think of a reason why the conversion to "charge laying vehicle" would entail this port being sealed up. Also, if the battalion workshop wished to seal up this hole, it would be much easier to use its own removable plug rather than make the new plug in the photo. The best explanation is that the Tiger was built when the port had already been deleted from the tank's specification, but the factory held a number of turret armour walls that already had a hole drilled. The factory had the means and the motivation to make this invisible seal for the hole.